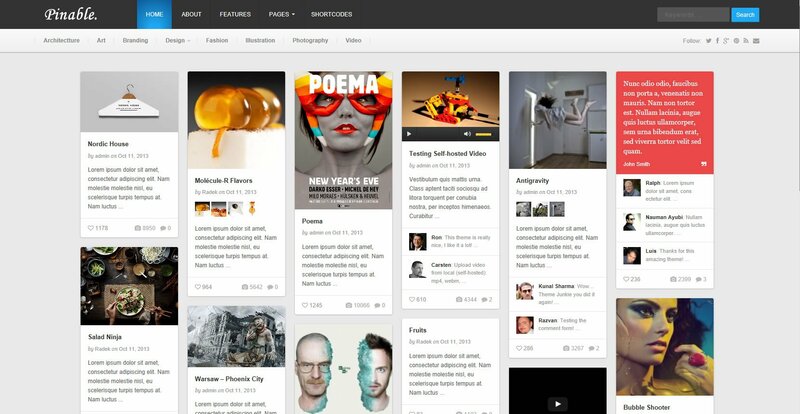 Pinable is the Pinterest-style theme for curating creative content online. Pinable theme would be perfect for a portfolio website, personal blog, an online diary or as an affiliate marketing content site. A secondary menu can be setup to link to different post categories and with multiple post format support, you can post a self-hosted or embedded video, quotes image gallery or even a simple link. Notable features are a built-in post view counter and “Like-it” counter, the ability to show comments in the post “boxes” and infinite scrolling.